This indicator depends on the variety of ways which CasinoEuro offers his clients to contact customer support and the speed with which it solves a problem, as also the overall customer experience. 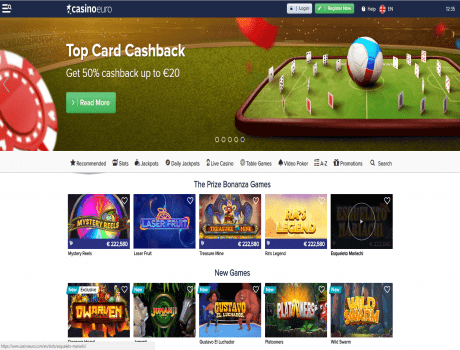 The reputation rating of CasinoEuro is based on its popularity in online space - comments, user ratings on other sites, and social networking likes. You must claim the Offer on the deposit page before making the deposit in order to receive the offer. Not all games in Casino, Live Casino or Mobile Casino contribute the same amount to the bonus wagering requirement. Certain games will have a higher % contribution than others and some do not contribute at all.